Niche: Spells. 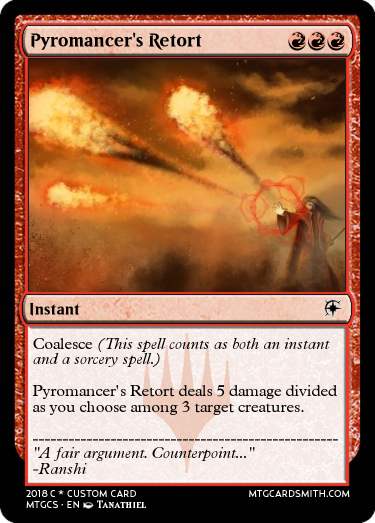 I use spells that will damage opponents and creatures they control, and using creatures that are benefited by the use of spells, creating a double boost. My Ranshi's personality is largely based on the person behind the username; me. He has a curious mix of thoughtfulness and brash hot-headedness, energetic, yet mellow at times, and with a burning passion, a pugnacious streak, and a cynical, punny, ironic sense of humor. 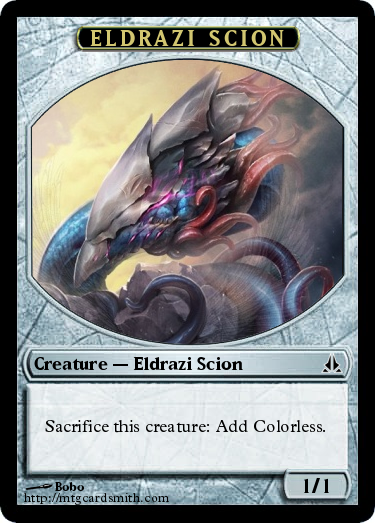 Niche: Mostly lifegain and milling, with some bit of creature destruction and discarding. 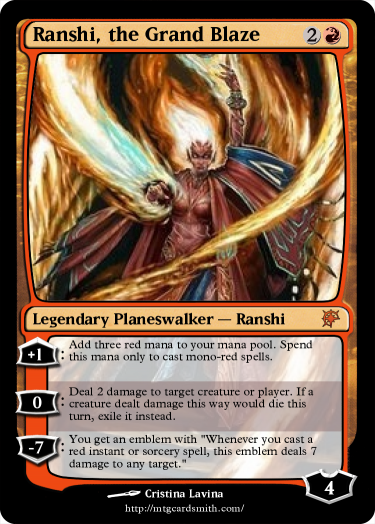 Before we begin, I just want to say that I removed Form Elemental from my list of cards because I saw what Lujikul did, removing a card to have a flex slot. 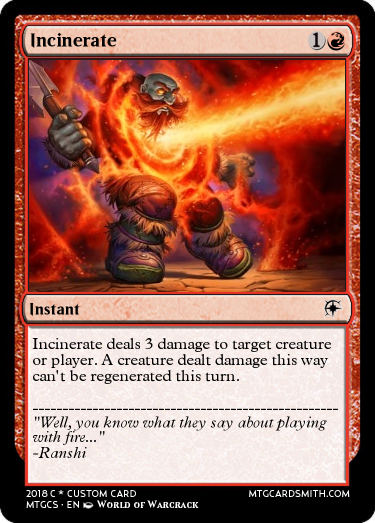 Also, Elementalize does basically the same thing but better. But with that out of the way, let's get on with the Story Blurb! When Aggrol walked into the town, it seemed deserted. However, he knew that people were hiding from him, as he had seen them wandering around the town doing things just minutes before. He walked to the fountain in the middle of the town, and sat down for a rest. He didn't actually need a rest, but he just wanted to see if anyone would be brave enough to come out and speak to him. Sure enough, after about a half an hour, someone came out of one of the houses. He looked around 15, from what Aggrol had learned of human biology in his science classes. He was shakily holding a sword out in front of him as he walked toward him. "Who are you, what are you, where are you from, and why are you here?" the boy asked. Aggrol responded,"Hello. My name is Aggrol, and I am an elemental. I am from a place called Degare. I have no idea where I am and hope to find out more about this world from you people." "My name is Cliff. I've never heard of an elemental before, or any place called Degare. This is the town of Gewar, and this continent is called Selamore. The world on which this continent resides is called Clancularius." The boy, Cliff, seemed to be sensing nothing hostile from Aggrol, and began lowering his sword, although still keeping it in a place where he could quickly access it. "Well, an elemental is a creature formed from the pure energies of the elements of Earth, Air, Fire, and Water. I seem to have came here from my world, and I don't know anything about my surroundings. Some maps or something would be useful." Aggrol replied. "Wait here," Cliff said, and ran off. While he was gone, Aggrol began seeing crowds of people gather around him, whispering about him. When Cliff came back, somebody was with him. "Hello!" the newcomer said. 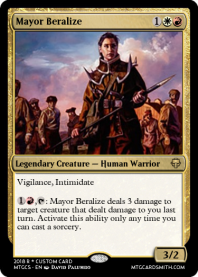 "I am Mayor Beralize. I have reviewed what Cliff has told me and decided to trust you. But should that trust be broken..." She touched a dagger latched onto her belt. No more was needed to be said. "Do not worry." Aggrol promised. "I will not harm you or anyone in this town. In fact, I will help you for your hospitality. I know of some ruins in the forest filled with artifacts and treasure. Send your bravest adventurers with me, and I will show you the tower. Then, you can bring back as much treasure as you wish. All I wish for in return is advice and some maps of the surrounding areas. What do you say?" "Well, this certainly is a tempting offer," Mayor Beralize said. "I will come. Any other volunteers?" "I will!" Surprisingly, Cliff was the one that rose his voice. "I can do it. Please, let me come with!" "Well, I guess I can't stop you," Mayor Beralize sighed. "Let's get prepared and go." 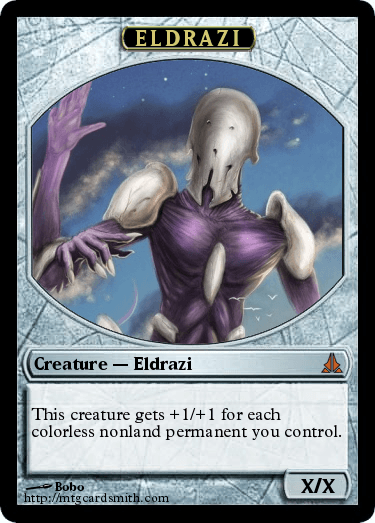 @Aggroman15 So, what's the deal with the Innistrad artworks? 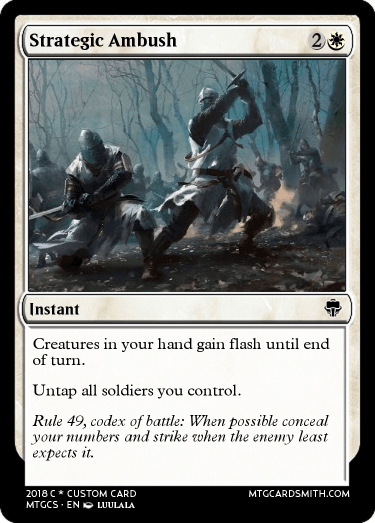 The top card is clearly a Hanweir Militia Captain, for example. And the second one is a green card I forget the name of but my brother frequently uses in his Clue Deck. @Aggroman15, I feel like I may have lost you too. Is this like a prompt ish thing like from d&d or something? I am well aware, my brother just uses it in his clue deck as a creature filler. @Ranshi922 No, it's not at all D&D related. I just like making the story for my guy. 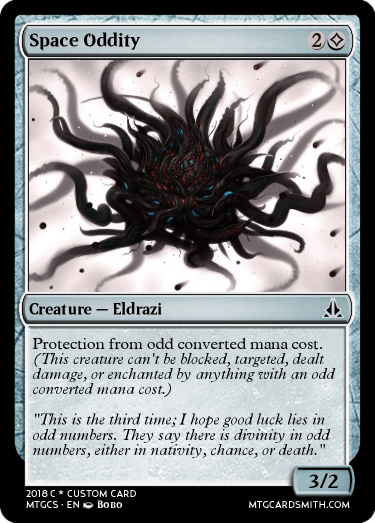 Also, to both you and @Fallen_Lord_Vulganos PLEASE stop being like "Oh, this art is from this real card!" 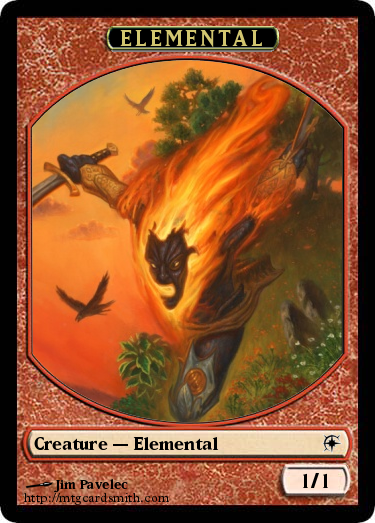 I'm too lazy to actually find good art online for all my cards, so I just find art from real magic cards that fit the card for some of them. @Ranshi922 What do you mean by prompt? 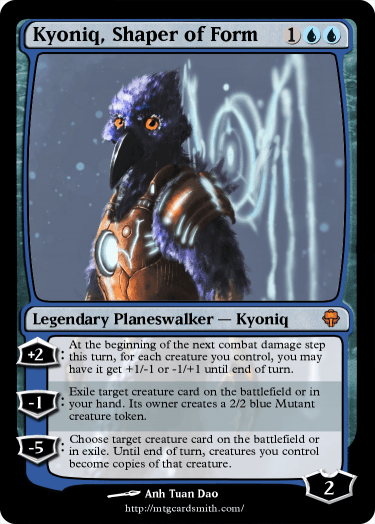 My entry: Kyoniq, Shaper of Form. 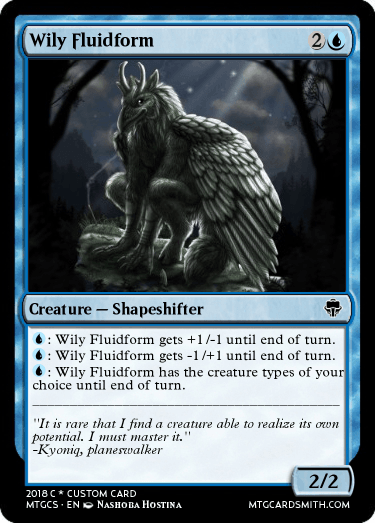 Niche is changing creatures (power/toughness and abilities). And finally, my story segment. It was just a simple spell, really. He was going to enhance her with stronger wings and bright feathers. She had said she wanted red feathers, and he would do anything for her, Janial, his best friend in the world, his partner. But something slipped in the magic, and Kyoniq could do nothing as he watched the spell go awry in horror. And as he saw her twisted, deformed body lying on the floor of his tower, something sparked inside of him and he was flung into eternity, far from his home, drowning his grief and guilt in tides of null. Kyoniq came to his senses, coughing and sputtering. His mind's eye swept into the continent on the horizon and showed him a huge black tower on a plain. This tower was preventing him from leaving, he knew. He must reach it. But first, he must do a little exploring. Phantasmal wings appeared on Kyoniq's back and he soared into the island's interior. Many of you may not be super interested by my Story Blurbs, but I don't care. I like making them, so I will keep making them! So here comes the next one! They left in the morning. They needed as much daylight as possible to get as far as possible in the day. They ran into their first problem before they even got to the forest. When they went to pick up Aggrol's hydra, it bared its fangs at Mayor Beralize, looking at her like he completely and utterly despised her. "Woah, boy. No need to get angry. These people are with me." Aggrol said, attempting to calm the hydra. However, it did nothing. In the end, Aggrol decided to leave the hydra. He had traveling companions this time. What could go wrong? They got to the tower around noon the next day. The only creature that they encountered was a large wolf, which Cliff dispatched of with his sword. "Take that, you dumb beast!" he said triumphantly. Aggrol smiled. The boy knew his way with a sword, that much was certain. As they entered the tower, Beralize's eyes went wide. "Look at all this gold! I could - I mean, the town could prosper so much from this! Thank you for showing us this!" But Cliff's attention was not on the gold or jewels, but on a strange statue on a pedestal on the top floor. It appeared to be of a wurm. "Guys! Come look at this!" he yelled. They went up to check it out. "So what?" Beralize said. "It's an old crumbly statue. Who cares? Grab as much gold as you can carry and let's get out of here!" But Cliff found himself drawn to the statue, and grabbed it and put it in his bag. "OK! Now we can go!" he exclaimed. But as they left, they found out that something else had other ideas. An enormous wurm burst out of the ground, winding its body around them, keeping them from escaping. "Don't worry!" Aggrol shouted. 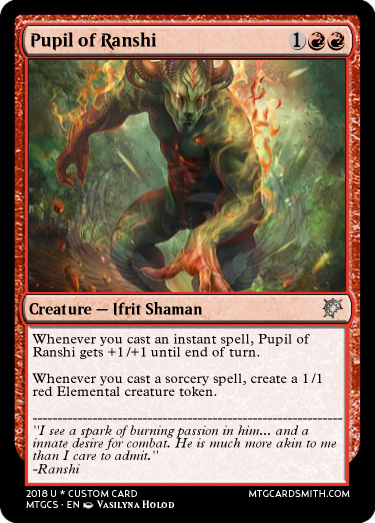 "I can turn it into an elemental that's under my - what the heck? It's not working!" "Uhhh... Guys? I think I know why." Cliff held out the statue. 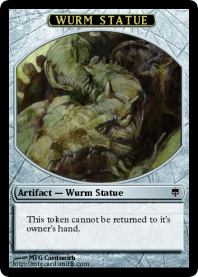 Looking closer at it and the wurm, it appeared that the statue was of the wurm. There were even little chips in the wurm where there were chips on the statue. "Cliff! I have an idea!" Aggrol yelled. "Yeah, I do too! Kill it!" Beralize said. She lifted her spear, and attempted to plunge it into where she assumed the wurm's heart was. "It's as hard as rock! I can't get through!" she said. "Just as I thought!" Aggrol exclaimed. 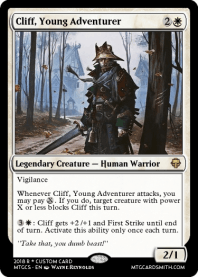 "Cliff! Smash the statue!" "Really? This could be really valuable!" Cliff responded. "JUST DO IT!" Aggrol yelled. "Jeez, alright!" I'll do it." He threw the statue at the tower. As the statue hit the tower and shattered, cracks started appearing in the wurm's body. It froze, and then shattered into a million pieces. "OK. I'm really glad that worked." Aggrol sighed with relief. "The wurm must have been the external manifestation of the statue. 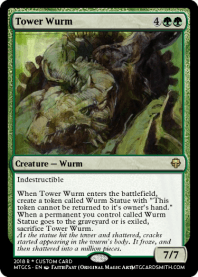 By breaking the statue, we broke the wurm." "Well then." Beralize said. "Let's grab the gold and go before anyone else decides to show up." Were we supposed to provide story? I will answer questions asked. The stories are optional like said earlier but they might help with the flavor of the cards a little. I would however recommend you all to be patient with the writing or you might get tired of it. This journey might be long. I realized that I had not given any information regarding colorless choices. If you decide to go colorless you'll have a starting max mana cost of 4 instead of 3 as compensation. OK cool. I probably won’t get tired of it, because I love writing stories, but I won’t be posting any more until Monday, as I am on a trip until then, and all I have to write these comments with is an iPad with crappy internet access. So yeah, I am going to be taking a break from my story for a bit. But when I get back, I am going to be creating a map of what my guy has seen so far, so that should be cool. Bugs buzz in the harmless courtyard that the school provides. Leading out of the courtyard a trail; it runs through the wall into the wilderness. The year of 2178. This is what has become of school; at least specific study school. In sessions around the building and in the wilderness students diligently envelop the knowledge that teachers feed to them. Among these sessions is Thomas; today he is at session in the Northern part of the wilderness about a mile from the courtyard. Teacher rambles on about the beauties of the wild flowers that float just on the edge of the clearing the session takes place in. Thomas of six years of age sits on the edge of the session, so close to a tree he could lean on it. Yet he diligently as every other student takes notes on the session’s lesson. Thomas looks up to answer a question that no one else has answered yet, then...a flash of white light. The session resumes; Thomas still has his hand raised. Dumbfounded he puts his hand down, then he precedes to tune into the teacher’s lesson. Butterflies. That is what it was. Thomas takes note of this, and after the first several minutes of the speech he drifts off into deep thought. The session ends and he realizes he forgot to take notes, so he asks some friends. As a typical day would grant they are given an hour to socialize in person before they return to the modernized reality they reside in. Thomas, as usual sits under the Apricot tree that grows just behind where he was sitting. He closes his eyes to resolve the turmoil inside of him and adapt to the peacefulness he wants. After about 15 minutes he opens his eyes; there in his left hand is a small silver apricot. Unclear of how it got there Thomas just stares at it. Turning the apricot in his hand he wonders how such a stellar organism has gotten here. Time passes at what seems like a millionth of a second. Social session ends, and Thomas sets down the apricot. As he sets it down the apricot begins to glow. Then, again...another flash of light. The apricot disappears. Thomas now stands in a larger clearing with his classmates awaiting the Angelic migration. After about an hour the first trickle of Angelia butterflies come in. After several minutes of the trickle an explosion of butterflies rush out of the woods. As the horde disappears into the trees everyone stares as if they can still see them. A few still come from the woods into the clearing. Thomas closed his eyes because he thought it was over, then he feels tiny legs on his nose. He opens his eyes; another flash of light. He is running down the trail towards where his session was yesterday; following the butterfly that has landed on his nose. Thomas bursts out of the dense vegetation that the butterfly had led him through. There in the center of the clearing the apricot. The butterfly flies down and picks it up; it seems to struggle in the task. Thomas rushes over to help the butterfly. Upon contact with the strange silver apricot another flash of light. Nothing no one stands in the clearing. Thomas is nowhere to be found at all. 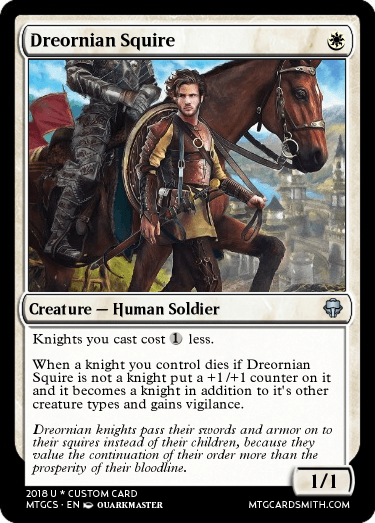 There was once a man who once conquered a large swath of a continent in the plane of Solania with his exceptional powers in the dark arts, swordsmanship, and the most important was, the leadership skill. The empire was named as Dreadfell, and it was notorious for its 'sanctified' outlaws, causing distrust and fear to the neighboring kingdoms. But due to the sheer might and magic of the empire, as they were using dark and questionable methods such as summoning horrific abominations and demons from another plane of existence to fill the rank of their armies, no one dared to wage war agains the empire. And to secure the throne forever, the emperor immortalized himself in his own master-crafted dark suit of armor. There was nothing more important than having power after all. Not even a family, since he had already seen that other people were very much unreliable. The emperor was once an orphan after all. Years passed and the empire prospered in its duality of its morals, corruptions so deeply embedded beneath its benevolent facade. But still even the lowest rank of citizen could get good works and bounty, by enlisting themselves as a sort of sanctified mercenaries, with a simple rule: No any kind of harm should be dealt to their fellow citizens of the empire unless it's deemed as necessary. Unless if they were a part of the noble families of course. One day, an attempt to assassinate the emperor happened. Like many other attempts, this one was caused by an angry neighboring kingdom that got pillaged by the mercenaries from the empire. 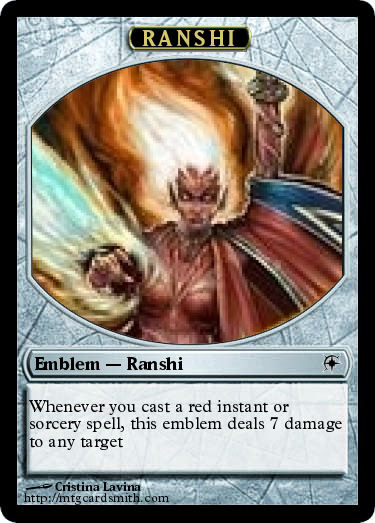 But this one, the assassin had a trump card in her sleeve: A banishment scroll so powerful it could trap an Eldrazi Titan in a meager object such as a simple djinn lamp. But the emperor resisted as his own strange but powerful magic and willpower disallowed the spell to resolve. And something terrible yet spectacular happened: The spell went haywire and instead it triggered the dormant planeswalker spark that hidden deep inside the soul of the dark king. The spark that gave him powers to conquer the land and its people. 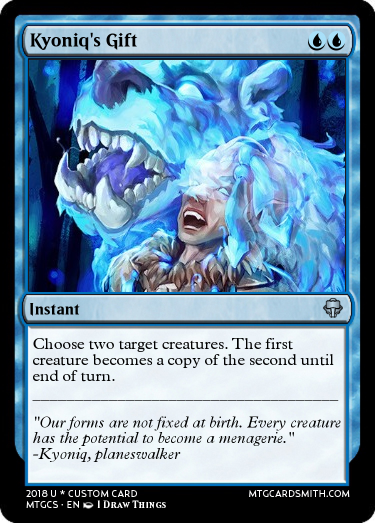 In short: The banishment spell imploded. And everything within the vicinity of the spell was sucked inside, including the castle of the king himself, and along with it, the capital city. Floating away in the Blind Eternities, the former emperor of Dreadfell's soul reassembled himself along with his broken suit of armor that held together by his magic. And then he realized about an uncountable amount of worlds that lied out there. A new realization was dawned upon him: He was only a fool. After all his accomplishments, he felt like an insignificant ant that meant nothing in the vastness of the multiverse. 'Nothing else matters. Only power matters. No more contentment.' Thought him as he was wondering by the insignificant and meaningless reality he once lived in. In the end he willed himself to went towards an unknown and untamed plane, to test his amplified dark powers he just awakened before, and to claim anything he deemed as valuable. And the name of the first plane he went to was Clancularius. Yeah, not really. I pretty much just make mine up as I go. @DoctorFro The first challenge is scheduled to start 31th of August. However if enough of you want it to be earlier I could begin the 24th instead. 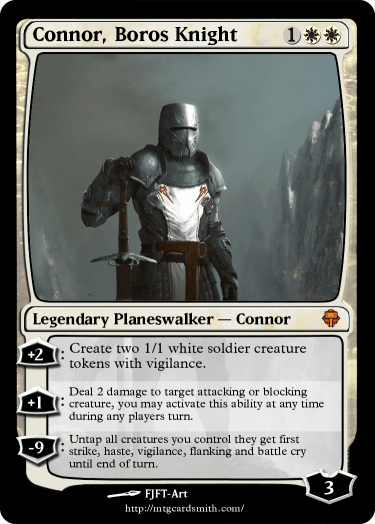 The first elimination would thus happen the 30th and that would be the deadline for new planeswalkers. @Everyone I suggest that you bookmark (click the star on) this thread so you don't miss any important information.